MEP design and engineering firm in Rockaway, Morris County, NJ is seeking to hire an MEP Project Manager / Engineer. Projects include retail fit out, office buildings, warehouses, municipal buildings, schools, and health care; core and shell, new buildings, and renovations. · Experience in engineering project management and design. · Familiar with all applicable codes and standards for commercial MEP design. · Proficient in AutoCAD and/or Revit and Microsoft Office/Excel. · Proficient in mechanical load calculation software (Carrier HAP, Trane Trace). · Capable of effective communication with clients/staff and responsiveness to client requests. · Capable of working independently and coordinating with support staff. · Identify and contact architectural firms and building owners and develop professional relationships with new clients. · Develop and maintain company marketing literature and website. · Evaluate new project requirements and prepare MEP engineering proposals. · Perform site surveys to obtain relevant existing conditions required for mechanical, electrical, plumbing, and fire protection design. · Attend project coordination meetings with architect and owner to evaluate specific project requirements. Develop project design criteria based on owner requirements and existing conditions to present the best MEP design solution. · Evaluate mechanical ventilation requirements, perform heating and cooling load calculations, and specify mechanical cooling, heating, and ventilation equipment and controls. Design ductwork and piping distribution. · Evaluate project electrical loads. Specify general lighting fixtures, emergency lighting fixtures, and layout based on owner lighting level requirements. · Evaluate project water usage and hot water requirements, and specify domestic hot water heating equipment and plumbing fixtures. Design domestic water and sanitary piping distribution. · Evaluate project natural gas requirements, and design gas piping distribution. · Communicate design requirements to staff of designers and CAD operators, and supervise the creation of MEP construction bidding and permit documents. Review work performed by support staff, and assure document completion based on project schedule. · Design and draft complete MEP construction documents based on company prototype standards, and assure coordination between all trades. · Review construction documents with architect and owner, and address client comments prior to bid or submission to the building department. Review and address building department comments. · Perform construction administration responsibilities including submittal and shop drawing review, construction meetings, responding to contractor RFIs, responding to field coordination issues, and punch list inspections. Qualified applicants can click here to submit resumes. 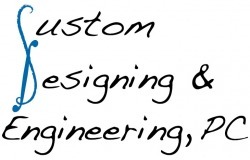 Custom Designing & Engineering (MEP design and engineering firm in Rockaway, Morris County, NJ) is seeking to hire an Electrical Designer. Projects include retail fit out, office buildings, warehouses, municipal buildings, schools, and health care; core and shell, new buildings, and renovations. - Familiar with all applicable codes and standards for Electrical design. - Capable of working independently and coordinating with support staff. - Capable of effective communication with clients/staff and responsiveness to client requests. - BS in engineering (preferred).